Located in what is now the now current Radio Caroline Record Library, the Captain's cabin located on Level 1 shared this space with the ships 1st Mate and the ships Hospital. If you take a look at our General Arrangement layout 518-RR-GA-001 can see that the Captain's Cabin was ideally located directly beneath the Bridge. 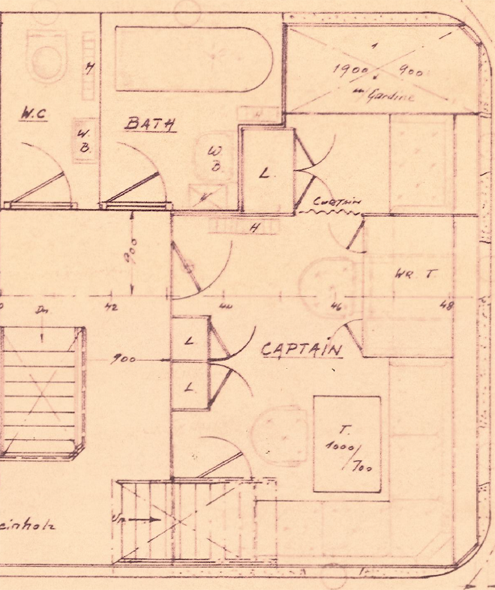 As you would expect, the Captains accomodation was self contained - complete with lounge area, writing table and of course his sleeping cabin (shown top right of the plan layout - detailed as 1900 x 900 Gardine). Not much is left to indicate the previous use of this area but if you are ever in the Record Library look up on the ceiling and you can still see the track which was used for the sleeping quarters privacy sliding partition.